I’ve always raved about how much better it is to watch movies on a big projected screen, but there’s a small problem: projectors are prohibitively expensive. Though you can get a half-decent 40-inch HDTV now for less than $500, even a budget projector will set you back at least $750 for 720p quality – and remember, any pixellation is infinitely more noticeable once it’s being blown up to typical projection size, so standard definition just isn’t an option anymore. We’ve purchased a budget LED projector to see if you can get that same big screen experience from something half the price. It cost just less than $400, purchased directly from the manufacturer ATCO in China – including delivery. Not only does it offer an admirable 3800 lumens of brightness, but it also comes with Android built-in for media player capabilities. 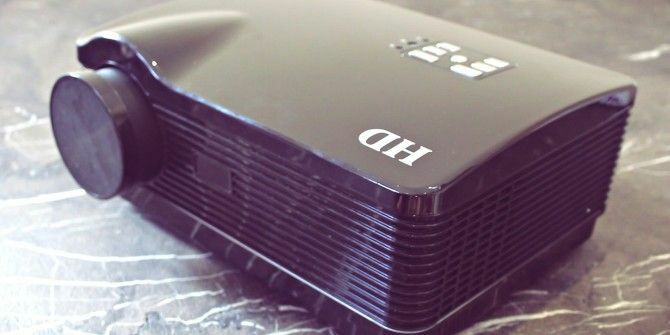 This is the cheapest projector you’ll find that does HD at a good brightness – you can buy “Pico” projectors AAXA P4X Pico Pocket Projector Review and Giveaway AAXA P4X Pico Pocket Projector Review and Giveaway What if you could bring a projector with you, wherever you go, and easily display presentations, movies, and more with it? This $299 AAXA P4X Pico Pocket Projector attempts to make this possible. Read More for less, but those may as well be powered by a flash light. The box it arrives in is the product box; nothing is wasted by fitting boxes within boxes. Unbranded, no fancy packaging – this is it. That’s $20 worth of packaging materials and design – you’re not wasting money on for a start. It’s a heavy package: 6.5 kilograms total, though only 4.5 kilograms of that is the projector. The projector itself was well-packaged in the usual expanded plastic foam. The only form of branding on the otherwise shiny black plastic device is the letters HD on the top; it hardly seems worth the printing effort. There seems to be a space for a logo or badge to be glued on the front, but none is supplied with our model. Around the back, there’s no shortage of sockets and ports, with all the standard component, S-VIDEO, VGA, as well as dual HDMI inputs and even an analog TV aerial socket. I don’t have an aerial on the house to test this, but I wouldn’t expect it to work with modern digital services anyway. There are two USB ports and an SD card slot too: remember, this has Android built-in so you should be able to play media directly on it without the need for yet another little box. There’s a 2W built-in speaker – and while it’s nothing worthy of high praise, it’s not particularly bad either, certainly better than some cheap laptops. Component audio ports are provided for audio output directly from the projector. This is really what this review is all about: can you get a decent size and quality of picture, at a reasonable brightness? I’m not expecting to be able to use it in the daytime, but I don’t expect to need blackout curtains either. I’m also expecting a little pixellation from a 720p device given I’ll be aiming to project on a fairly large wall, but not so much pixellation that it really detracts from the experience. Big screen fun, basically – not cinema buff quality. The diagonal projected image size it achieves is about 195cm (76 inches) at 250cm (8.2 foot) distance from the wall. Extrapolating that to a throw to screen-size ratio gives about 0.8, so you should be able to calculate how large your image will be. It certainly isn’t an ultra-short throw like the Optoma gaming projector Optoma GT750 3D Gaming Projector Review and Giveaway Optoma GT750 3D Gaming Projector Review and Giveaway I love projectors; I have fond memories of nights spent in front of the projector with all my housemates, as we snuggled under the kotatsu (a Japanese heated table thing) and settled in to watch... Read More we reviewed: that thing could project onto an entire living room wall while sitting right in front of it on a coffee table. This device will do best in a large room, mounted on the ceiling or a shelving at the back. At smaller sizes, I couldn’t quite get the focus perfect though: when the middle area of the screen was in focus, the edges seemed to blur slightly. At larger sizes, this wasn’t an issue. The total light output is claimed at 3800 lumens. This is actually on the upper end of projector brightnesses, and would give you a decent screen up to about 150 inches even with a little ambient light – impressive, considering the LED technology rather traditional halogen bulb. The quoted LED life is 50,000 hours – though clearly this would be hard for us to test fully. It’s non-replaceable, but before you get your knickers in a twist, a quick calculation shows that at 3 hours per day, every day, it should last about 45 years. The fans will break well before then, and you’ll probably need to upgrade to a holographic 3D projector by that time anyway. Focus adjustment is done by laboriously turning the lens, while a flimsy slider round the back adjusts the screen tilt – this is the only part of the build quality that felt a little sketchy to me. The introduction paragraph was a fair way back there, so you’re forgiven for forgetting the fact that this projector comes with Android built-in. Not only are you getting a half-decent budget projector, but a built-in Android TV stick Rikomagic MK802 IV and MK812A RK3188 Android Smart Mini PC Review and Giveaway Rikomagic MK802 IV and MK812A RK3188 Android Smart Mini PC Review and Giveaway A complete Android system for your TV - not a Chromecast, not an adapter for your phone – no additional hardware required. Android "TV sticks" are mini computers running Android. They have no screen, instead... Read More too. You can use your USB peripherals, play media from an SD card or USB storage device, stream using Netflix or run whatever apps you like: it’s Android. And you know what? It’s actually not half bad. It’s running stock 4.2.2 and is surprisingly responsive. Compared to the Android karaoke player Android Lemon KTV Karaoke Player Review and Giveaway Android Lemon KTV Karaoke Player Review and Giveaway The Lemon KTV Karaoke player (KHP-8836) is available direct from China for around $350 plus shipping or from Amazon for $349.99 with free shipping, complete with a selection of English and Chinese songs. Read More that I reviewed last month, this thing flies along beautifully. Antutu reports similarly, placing the identified “MBX dongle board” with a performance score of 9417, roughly in line with a Samsung Galaxy S2. In real terms, it just feels responsive: XBMC was able to smoothly stream from services, and YouTube handled HD videos just fine. The supplied wireless mouse helped too – rather than rely on a hybrid remote control that does neither job well enough, the mouse just lets you get on and use the system. You could easily plug in a keyboard as well given there are two USB ports – but for entering passwords, usernames, or searching YouTube, the mouse and on-screen keyboard certainly didn’t feel like a chore. I’ll be honest, I’m really pleasantly surprised. Not only is it a budget-priced projector with very competitive brightness, but it has a genuinely responsive Android system built-in, providing media playback without the need of yet another device. You will need a good distance to project from for the best results, but come on – it’s only $400! Explore more about: Home Theater, MakeUseOf Giveaway, Projector. Does it come w/ a manual zoom adjustment? I've tried looking online, but to no avail. I am extremely satisfied with something similar in setup for the past year and a half (except that it is two different units - the NEC V260x projector from Staples for 350$ and the tiny cigarette lighter sized Rikomagic MK802 IIIs for 55$). I'm willing to pay everything I have.... Just emptied my pockets. I have two dollars and eighty-five cents. I actually can't afford a projector now. I've always wanted to, but never purchased one. At this time a projector is out of my price range, however, when this changes, I am willing to pay whatever it costs for quality. I have never purchased a HD Projector but I would probably be willing to pay $300-$400 for one. yes i wanna buy hd projector to play all my games and moves on bigger screen, i haven't bought any projectors till now. I have no clue what these things are worth and have never used one. I would pay up to about 150 euros for one just because I believe it can be cheaper. I'm willing to pay $99 with shipping to my door included in that price. I have no money but I am willing to pay enough for it. I would consider paying $600 max, as thats my budget. I have not purchased one as of yet. Hopefully if I won this prize I wouldn't have to pay anything for a projector. Honestly maybe about $400 at most. Nope. I'd say no more than $400 max, considering you can get a pretty good TV for for not much more. I was impressed with the features vs price, that I went ahead and bit the bullet. Ordering was ok, but there was not an option to get a white case, although their advertising showed both black and white. I asked for a while case model in a comment box, so we will just have to see. I will report back with what I experience. Not more than $700 but I belive in short time things would be better with more stuff 3d,1080p for less price. This projector looks great for that price, tnx for info!! I'd pay 800-1000€ for one, never bought any before though. If I had the money and an income and was looking for a projector, I would probably spend between $700-$1000 or so. I have never personally had a projector (except for the ancient slide projector my dad had), bit I did have one at a previous job and that was before HD. I just got one for $800 and I am very satisfied with it. It's a 1080p 3d projector. It's called the BenQ W1070. About 300$. No, not really, I never had one. Up to $500 for a good quality one. $500 tops, still thinking about it. I'd look for one in the $500 range, but this one looks pretty nice for the price. And it has 4.2.2 built in. I was expecting 2.3 or something, and was pleasantly surprised. Great article. I'd rather pay for quality. Not necessary brand name, but just well-rated. I have never priced them. I had assumed they were way out of my price range. I guess I would consider pay $200 to $300 for a fairly small one. about 400$. No, I don't have one yet. This is really on my husband's wish list. I have no idea what his budget is. $400 is about right. But I don't have one. U$S 200, I will use it for seminars and workshops, I borrow one every tome I need. I haven't bought a HD Projector recently, but I would love to find a great budget one for under $500. I guess 300 to 400 € would be a fair price. I never bought one so far. Around $300 but I don't have one. I'd make use of an HD projector, but I wouldn't buy one. So far when I need to use one I just borrow one. I'd pay $500 if it performed well under conditions I would use it in-failry bright room, limited control over projector to screen distance. It is for work not play so making the content look its best without drawing attention to itself is most important to me. Since I don't really "need" one, I'm willing to pay $20 for one to have one lying around for occasional use. My budget would be $200 for a HD projector. I don't own one yet. I wouldn't mind getting one just to see if it's viable for gaming and movie watching. Looks great. Now to check whether it's available in Malaysia! Never purchased one, I probably won’t consider spending to much money. I don't have much room for a screen to project onto, so I wouldn't pay more than $200 for a projector. For a good quality projector with some of the bells and whistles I would pay $150 if it was on sale. I have to be honest, I know you get what you pay for but I could not at this time go a dollar over $300, and even that would be tough! Never purchased one, and for my needs it would be nice but not necessary. I might pay $200 at most. I can pay 300$. I have never own such projector. Willing to pay 250$ for an HD projector. I don't have a projector, but would be willing to pay $250. Around $300. It would be perfect with network conectivity (wifi and/or wired)! Around $300 and will exceed the price range if its actually worth it! Nope, I don't own a projector! It depends on the quality. Many projector's color balance is way off. Haven't purchased one before, and in my financial position it isn't something I'd really consider for any price at the moment. Maybe under $150, but I doubt I'd really find anything decent for that price. $300. Never owned one myself. Nothing. It's a nice to have, but I don't have extra cash to spend on one of these - though I'd love to have one. I am willing to pay around $400 for a projector that could last. $300 tops I wouldnt go much higher than that. I guess $300 - $400 is quite reasonable, but it's a bit beyond my current budget unless I needed it for business. For now, displaying from my computers and tablets onto my TVs is fine. I have my second budget LCD player, first was a mere vga projector from NEC (I think ithad the number 300) for about $400 back then, a real steal and I was happy for about 8 years. Then problems started, Now I have a 720pixel projector from Panasonic (PT LW 25H). While it works ok, it lacks connectivity (lacks speaker out, which is a pitty since the build in ones are not good, no HDMI), gives off too much light to the back and side of the projector which is a bit distracting when you sit behind the machine,and the Keystone comes on every so often without reason. It cost $400 as well, that's why I bough it. $500 isthe top price for me on a beamer, I am not crazy about all the extras. $400 seems about right. Like the added bonus of Android. I might just look at getting one of these if I don't win. I don't have a projector yet and I'd spend no more than $500 for one. I have never previously purchased a projector and would not pay more than $500. Not more than $500. Haven't purchased any before. I’d pay a maximum of $500, but a projector is toward the bottom of my wish list. I never buy a projector before and I currently look for a money wise projector. I will look at this projector. I'd pay a maximum of $500, but a projector is toward the bottom of my wish list. $300 would be what I am willing to pay. Willing to pay between $200 - $300 due to the fact that 4K is rising and probably will be $500+ or more. The price I'm willing to pay should benefit the average consumer very well no matter what's their budget is. My use case for a projector would likely be at cycling and skiing events, as a volunteer for various non-profits. I would expect to pay upwards of $1000 for the brightness required, so this budget projector looks good to me! A fried demoed a projector displaying a huge screen, and even the folks in the office across the alley were impressed. Needless to say, this is a tech I am looking forward to bringing home. I wouldn't be willing to pay anything at all, since it's highly unlikely I'd ever even use it. BUT I'd sure like to win it! I used to buy 2nd hand projector for about $300. I'm willing to pay the price of it as long as I'm ok and contended with the output and quality. Never thought about buying a projector but at this price I am giving it serious thought. Since reading this article I might consider getting one soon as the price on this one is about right for me. Thanks for the info!! I have no idea how much projectors cost, much less HD ones. I'd have to do more research to have an acceptable price range. Never bought one. lol I haven't looked at projector prices in years last time I looked they were $800 which I knew I couldn't afford but if I could afford one I say $400 seems like a great price. I would easily pay between $400 and $450 , since this sounds more than competitive with other projectors in this price range. I've been considering purchasing a budget projector for quite a while, but held off due to lack of justifiable funds. I'm glad I didn't, since this ATCO projector seems like an ideal projector for me! The LED bulb life sounds like an excellent alternative to the halogen bulbs other projectors use. Congratulations in advance to whoever wins this. I do not have one but I could pay up to €300 for one. I guess $400. I have never really considered buying a projector before as my main TV. I have an SD projector thats hardly ever used so buying a HD pne would be unlikely at any price. At most $1000 and the specs has to be on par with a traditional 50'+ LED TV. No point in settling for less if I can buy a better alternative for the same price. Don't know if I would pay for a projector, but it might be nice to play around with - especially with Android built in. Nice touch. I wouldn't pay more than $500 for a projector. I'll be using it for gaming as well as family movie time. As I have no pressing need, at the moment I am not willing to pay anything for it. A nice accessory would be the ability to show all my old slides. I could only afford a cheap one so it would be really great to win this. Built in adroid OS is just awsome. overall an excellent product. I've got no idea about projectors so can't say anything, but i guess they'll sure cost more than a Monitor so a little over the quality of monitor i'd be looking for. Around 300$ would be nice. I haven't purchased one till now. I would pay up to $400. Especially if it was to play a tribute slideshow for a family reunion or a 50th anniversary for parents/grandparents. Currently I can't even afford to think about one, but this looks excellent for the price! I've always been good at wishful thinking! I’d pay about $500 max. I'd love to have an HD projector. I am a big movie buff, and while this might not be the best quality, it might be something that would be capable of being a good starter for me with the technology. I think $400 is a very reasonable price for these specs, but it's not in my budget. I might buy at $100. I'd pay about $500 max. At this point I don't have the money to spend but about 400.00 if I did. Asking price for this is about my limit - using a borrowed BenQ at the moment - great for family movie nights. $400 including shipping sounds like right on the money! I have an Optomo that every time I use it I fear the bulb is boing to go out... with 50,000 hour LED, life is a dream! And Android 4.2.2? Whats not to love about this projector? Depending on what I think the quality is, $400-$500 for an HD projector. And NO, I have not bought one. 300$-400$ price bracket is perfect for HD projector. and answer to the second question is NO . Would like to find one in the $300 - $400 range. I'm not sure how much I would pay but, I'd be willing to take a chance and hack myself one with spare parts I have laying around. I could see myself spending $1500 to $2000 for a good projector if I had the room to put it in. I haven't really priced them out, so I'm not really sure yet. It hasn't been a priority purchase. I would not pay more than the cost of a good LED TV. These days, $500 max. I would like to see them come down to $200 - $250. Nothing, I hardly ever use projectors. I would pay maximum of $300. I don't want to spend a lot on something that I could just use a dvd player or xbox for. No i dont already own one but it would be cool! I've never bought a projector for personal use, however for work I've spent roughly $2000 for a good projector and ceiling mount. For personal use, I'd keep it under $300. It would depend on the features of the projector, so I would not lock myself into a price corner. I have a 55" HDTV, so I'm not really in the market for a projector. But if I were I would do my research to get the best feature set at the best price. As always if you happen to be giving one away, I am game. Don't have the funds right now, but this one sounds like a good buy at this price! Well, the Brookstone slim pico projector is about 99USD on sale right now, so I think 100-250 is the max I'd pay for a budget projector. I havent bought for myself. In the Philippines, I think it costs Php 30,000. I'd gladly pay for 15000,if there is such an LCD Projector which costs that much only. I probably wouldn't buy one, so $0 (i.e. winning this one) is what I would be willing to pay. If it's a very good one, with a long throw, excellent lighting, etc., maybe 1,500. It all depends on the projector, but ~$500 would be my max. I have not purchased one yet. I would pay 3 to $500 for a projector. I have never bought one before but I always thought about getting one. Easy for video / graphical video presentations and a little saturday night movie on the side! Max $550. No I do not have one. I had always thought a lot would need to be spent on a projector, which is why I have never gone for it - at this level it starts to become appealing, even if the quality doesn't match the high end models. I've been looking at projectors for an outdoor theater, and have been hoping to stay in the $500-$600 range. Also, I don't quite understand the part of the review that said " I don’t have an aerial on the house to test this, but I wouldn’t expect it to work with modern digital services anyway." If there's an RF input for an antenna, I'd guess there's a tuner in there somewhere? Would be interesting to mess with that. I would buy an HD projector if the price was around the range of a decent 40-50" TV. Fits my budget great! Have been waiting for a good projector. I think around 500 dollar would be acceptable for my budget. I need this for summer neighborhood movies. Great price. This is perfect for my needs. For presentations @ work and home movies. I'm living in a rented apartment, so can't really do much decorating, a projector would really make a big difference from white walls everywhere. $400 sounds like a bargain tbh, seen 'em going for $3k+ which is way outta my league. $300 – 400 is the price range for me. I haven't purchase one. Not really sure of my rice point...depends on the quality & features, I guess. $ 400 to $500 is the right range for my budget. I would expect to pay around $900 for a high quality high def projector, so I'm very intrigued by this one. I'd like to pay around $500, but might go to $750 depending on how bright it is and quality. $300 - 400 is what I would be willing to part with. I have yet to purchase one. For the price, this is a great value. It offers a lot of input options that make my current projector look like it came from the stone age. This would make a great replacement for my projector in my man cave, and I could eliminate a lot of excess cabling in use right now. I think if I were to ever go for a projector I would buy a really good one with a short throw since I don't have much space to project in my house. I haven't purchased one , but am moving soon and may get one for the new place. Not sure I dont know what are the price of those Projector. For an HD Projector $700-800 for a decent one. This one actually looks good for the price. Nebula Mars Review: This IS The Portable Projector You’re Looking For!